Championship of the San Gabriel Valley Classic today: La Verne Lutheran at host Maranatha, 4:30 p.m.
Bonita pitcher Justin Garza’s incredible season was the top story of the year in 2012 .. Who else made the top ten? The past calendar year was quite successful for local programs and athletes. 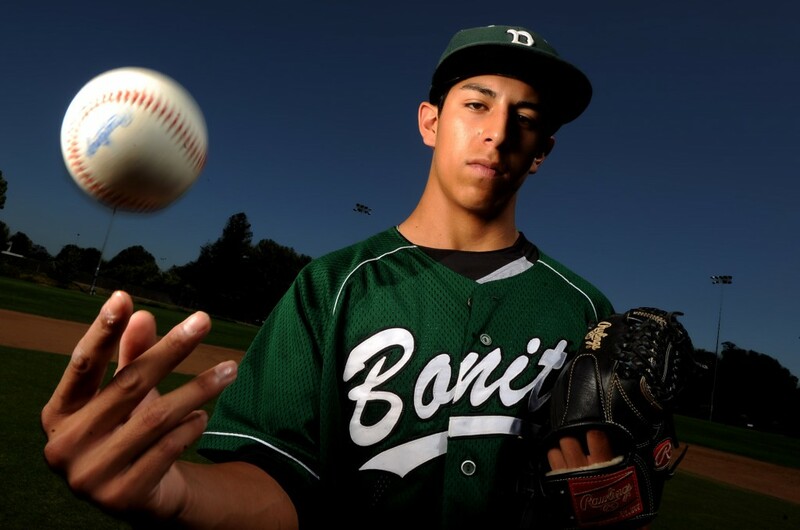 But it was particularly rewarding for Bonita High School baseball pitcher Justin Garza, who set his name in Valley lore with one of the most dominating seasons in history while leading the Bearcats to their first CIF-Southern Section division title since 1951. Garza, now at Cal State Fullerton, earned All-America honors from Baseball America after going 12-1 with a 0.72 ERA. He capped his historic season by retiring the final 12 batters to lead the Bearcats to a 5-1 victory over Alhambra in the Division 3 title game at Dodger Stadium in June. Garza finished his final two years 25-1. El Monte High School’s Brandon Martinez broke perhaps the area’s most cherished records. Martinez, who helped the Lions earn a share of their first league football title since 1979 with a co-Mission Valley League crown, became the area’s single-season leader with 4,243 yards and 44 touchdowns. He surpassed former Los Altos great Mike Smith (1982) for the yardage mark and Bishop Amat’s Pat Haden (1970) and Los Altos’ Felipe Aguilar (2000) for the touchdown record. El Monte advanced to the quarterfinals. Northview has set the bar among area wrestling programs and added to its reputation in February and March by winning CIF-SS Southern Division and Masters titles en route to a solid finish at the state meet. Bobby Salinas led a group of six Vikings to win individual titles at the Southern Division championships and was one of seven competitors to advance to the state meet after the Vikings won Masters. It was a year of firsts for the Bearcats, who won the school’s first CIF-SS cross country title with a Division 2 crown, then topped it with their first CIF State title, also in Division II. Bonita, led by Marissa Scott, covered Fresno’s Woodward Park course in a combined 94 minutes, 10 seconds. The Bearcats won by 60 points. Bonita, which made runs at CIF-SS titles the previous three seasons, finally broke through by beating Alhambra for the Division 3 crown. The Bearcats were led by Garza, Tyler Heslop and Thomas Castro. All three were All-CIF-SS Division 3, with Garza the Player of the Year. The Lancers added to their area dominance by winning their fifth CIF-SS title since 1999 with a Division 3A crown. The Lancers, led by Paulina Santana, Dagmar Ramirez and Leeah Powell, beat Oak Park, 44-30 in the final. The sophomore showed she’s more than a talented basketball player by winning Division 3 titles in the long and triple jumps. She advanced to the state championships in the triple jump. The Cougars, after dominating in the NAIA, officially moved up to NCAA Division II for all sports. The early highlight to the move was the football team winning its last four games and finishing 4-7. The Mounties added to their recent success by winning the school’s fifth California Community College Athletic Association basketball title. Mt. SAC was helped by Ashley Burchfield, who prepped at San Dimas High School, and Leticia Galarza (Bishop Amat). Mt. SAC saw its streak of five consecutive Southern California Football Association titles come to an end with a 30-21 loss to Bakersfield in the region title game. Mt. SAC had won five consecutive regional titles since 2008. COVINA – Damien survived a determined Rowland boys basketball team Saturday night in a 59-57 victory in the championship game of the 59th annual Covina Christmas Tournament. Rowland guard Joseph Dionisio’s last-second layup attempt in traffic missed the rim, securing the victory for the defending champion Spartans. This year was more of a series of battles and less of a coronation with Damien winning its last three games by a combined 10 points. Damien (11-4) did not trail Saturday, but it never felt comfortable as the Raiders squandered chances to take the lead. “They (Rowland) are great competitors and really well-coached,” Damien coach Matt Dunn said. “I watched them all tournament and I thought they were the best team throughout all four days. Chris Arzadon made a layup and was fouled with 4:08 remaining in the game, and his free throw pulled Rowland even for the first time since the opening moments. Jeremy Hemsley broke the tie with a short jumper in the lane to give Damien a 51-49 lead. Hemsley scored seven of his game-high 19 points in the fourth quarter and the sophomore went on to be named MVP of the tournament. Following two free throws by Dionisio, Damien senior forward Ayo Adedeji converted consecutive layups to extend the lead to four with just over a minute remaining. Adedeji, Isaiah McCullough, and Jared Dizon were named to the all-tournament team. Hemsley made one of two free throws with 14 seconds left in the fourth to put the Spartans ahead 57-55 and set up the failed final attempt by the Raiders that would have sent the game into overtime. 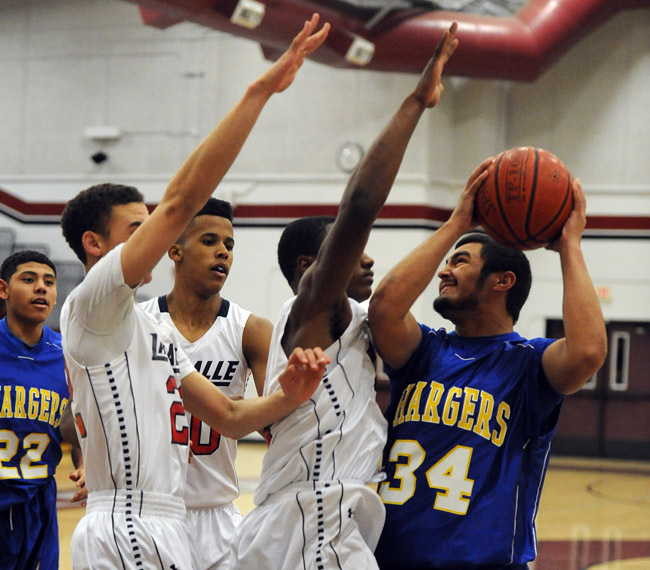 Seniors Dionisio, Arzadon, and Saeed Montoya scored 47 of Rowland’s 57 points. All of their points were scored from the second quarter on. Rowland entered having outscored its tournament opponents by an average of 29 points. Damien jumped out to a fast start. Adedeji followed up a 3-pointer with a blocked shot on Rowland’s next possession that led to a layup by McCullough, who also was fouled. McCullough’s free throw capped an 8-0 Spartans run and gave them their largest first-half lead, 20-11. Following a 3-pointer by Damien’s Keith Cavanaugh to open the second half, Rowland answered with seven consecutive points to close the gap to 33-32. But consecutive layups by Hemsley denied the Raiders the opportunity to take their first lead. California vs. Damien, 7 p.m.
Rowland vs. Covina, 8:30 p.m.
Sierra Vista vs. San Gabriel, 10 a.m.
South El Monte vs. Garey, 11:30 a.m.
Azusa vs. Mt. View, 1 p.m.
South Hills vs. Charter Oak, 2:30 p.m.
Los Altos vs. Northview, 4:30 p.m.
Bishop Amat vs. La Salle, 5:30 p.m. Follow tonight’s live chat of the Holiday Bowl, UCLA vs. Baylor, at 6:45 p.m. I’ll launch about an hour before the game. I’ll also have post-game interviews. Los Altos vs. California, 4 p.m.
Northview vs. Damien, 5:30 p.m.
Bishop Amat vs. Rowland, 7 p.m.
La Salle vs. Covina, 8:30 p.m. The La Salle High School boys basketball team broke with a long-running tradition of hosting its own tournament this season and may have started a new tradition in the longest-running tourney in the valley. The Lancers, ranked No. 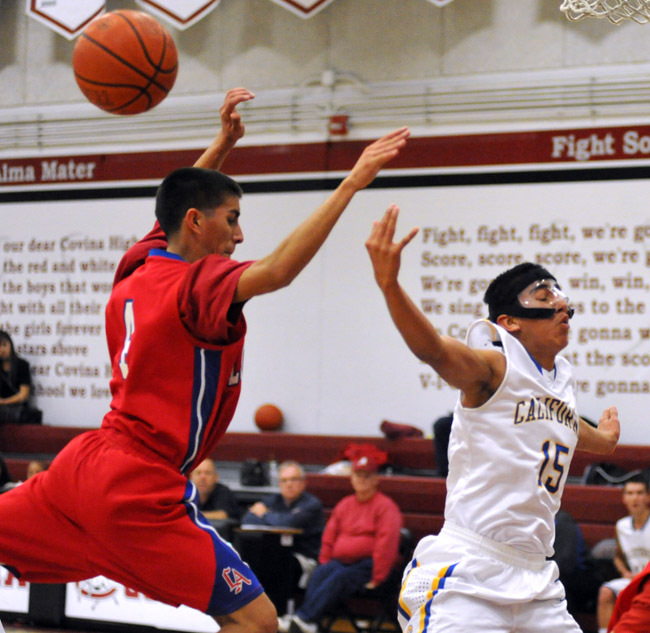 6 in CIF-Southern Section Division 4AA, defeated Charter Oak, 63-47, in a first-round game of the 59th annual Doc Sooter Christmas Tournament on Wednesday night at Covina High. La Salle (6-2) will play Covina, a 71-43 winner over Garey, today in a quarterfinal game at 4 p.m., while Charter Oak (4-8) plays a consolation game against Garey at 2:30 p.m.